This bread pudding is almost like a tart, with the croutons acting as a crunchy crust. Tender baby spinach in the filling turns incredibly silky when cooked. 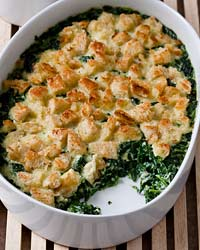 I always loved my Grammie’s creamed spinach casserole and this version even tops her recipe. Sorry Gram.